Now that the shouting’s over, should Democrats curb their enthusiasm for the implications of Doug Jones’s astonishing win in Alabama? Photo: Bill Clark/CQ-Roll Call,Inc. 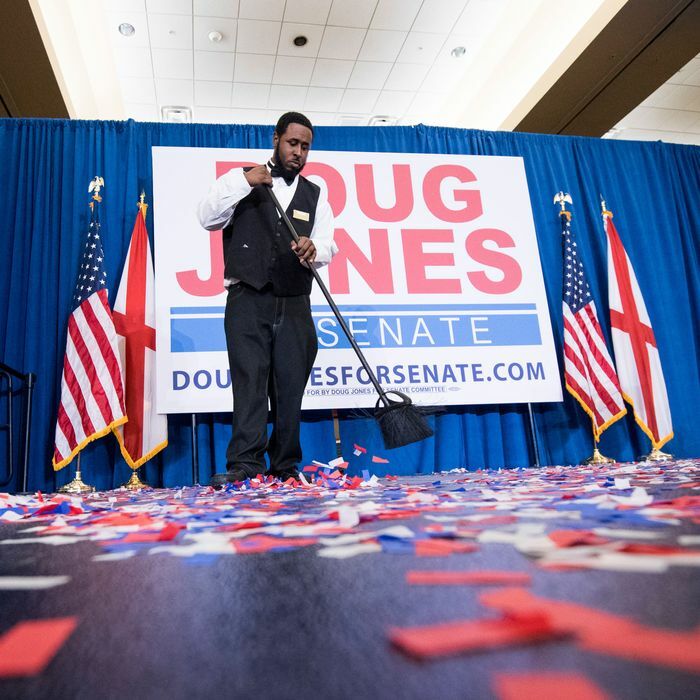 The celebration among Democrats after Doug Jones’s unlikely victory in an Alabama special Senate election on December 12 was sufficiently extravagant that it’s wise to take a step back and examine what it did and didn’t mean for American politics going forward. Iconic political journalist Elizabeth Drew gave excited donkeys a bit of an ice bath in a piece for The New Republic warning against an over-interpretation of the results. But while we are not going to see “a series of Alabamas” in 2018, there are some significant and very real implications for the future, so long as one keeps in mind the very uniqueness of the situation that Drew points out. A 2017 win in Alabama does not, for example, mean Democrats can suddenly stipulate that the 2018 Senate elections in similarly red territories like Wyoming or Nebraska will be competitive. There’s actually nothing that happened in Alabama that is especially relevant in highly conservative states with few minority voters and no huge controversies hanging over the GOP candidates. Yes, maybe Democrats will do several points better than they have done in the recent past, but not well enough to create a competitive contest. On the other hand, Jones will be in the Senate until at least 2020, and no one can take that away from Democrats, who can now see a credible path to a Senate majority in 2018 without future Alabamas, since a net gain of just two seats will flip the chamber. Nevada and Arizona looked like promising states for Democrats long before the Jones/Moore contest. John McCain’s declining health could well mean there will be a second Arizona seat at stake next November. And yes, the Alabama results do mean Democrats can dream of an upset win in very red Tennessee, where former governor and Nashville mayor Phil Bredesen goes into the race in much stronger shape than Doug Jones did. Even before Alabama, Democratic Senate incumbents facing voters in 2018 in relatively conservative states were doing well; none of them are in immediate danger of losing, and only a couple are highly vulnerable at the moment. Now it is more obvious than ever that partisan polarization has its limits, even in the most conservative states, if only because Republicans in places other than Alabama have their own internal differences that could prove fatal. It’s looking more and more like Democrats can play offense on a Senate landscape that looked so terrible for them going into 2017. Beyond the lowered Senate target for 2018, there are elements of the Alabama results that are not necessarily a product of unique local circumstances. Yes, the identity of the two candidates had something to do with the impressive African-American turnout that won the race for Jones. But we saw similarly high African-American — and also Hispanic and Asian-American — turnout in Virginia last month. Similarly, Jones did very well among younger voters, as did Ralph Northam in Virginia. It looks like the so-called Obama Coalition of young and minority voters that usually fails to show up proportionately in non-presidential elections might well go to the polls next year, and that could be decisive in close races. Should Democrats be excited about the renewed possibility of a 2018 wave? Absolutely. A Democratic House would throw a huge monkey wrench into any legislative plans for the GOP in the last half of Donald Trump’s term. And a Democratic Senate would be even more devastating to Trump, taking away his ability to stack SCOTUS and other federal courts with extremists enjoying life-time appointments. Taking away the GOP’s trifecta would also make it immeasurably more difficult for Trump and his allies to halt enforcement of, or further pare back, laws and regulations affecting the environment, the economy, or health and safety that corporations find annoying. So the wrong lessons for Democrats to take from what happened in Alabama last week are that all states are now purple or that 2018 will be a cakewalk. A tough Senate landscape, gerrymandering of the House by Republicans, trench warfare involving 36 gubernatorial races and even more state legislative races, the seemingly endless cash available to the GOP, hard-t0-predict international and domestic events — all these factors could make the midterms an abattoir for Democrats and disappointment at the end of the road a real possibility. But just a year after widespread talk of Democrats being weaker than at any time since the Harding Administration, happier days seem to be here again. And for people in horror over the election of Donald Trump, that’s worth celebrating.